Rio Ferdinand spoke about Chelsea’s forward options tonight after their 3-0 loss away to Barcelona in the Champions League. The Blues were humbled by a Lionel Messi masterclass at the Nou Camp this evening, going out of the last-16 4-1 on aggregate and looking distinctly second best across both legs. 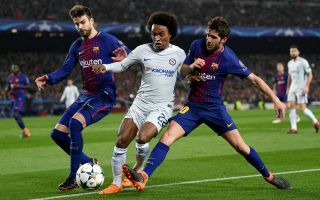 Chelsea showed some promise in the first game before allowing Barcelona back into it, but tonight they were certainly not at the races at all as Messi and co. demolished them with ease. Speaking afterwards, BT Sport pundit Ferdinand explained that a different calibre of centre-forward could have made all the difference for Chelsea. Back in the day, Chelsea and Barcelona played out some fiercely competitive contests, but now lack the same kind of warriors in their squad. Ferdinand named Diego Costa – who was sold by Chelsea this season – as the one the club must regret letting go, and also named the legendary Didier Drogba as a front-man from their past who could’ve made this a very different game tonight. ‘I think we’ve spoken about Conte being disappointed about the players who’ve come in and the players who’ve left in the summer’ Ferdinand said.